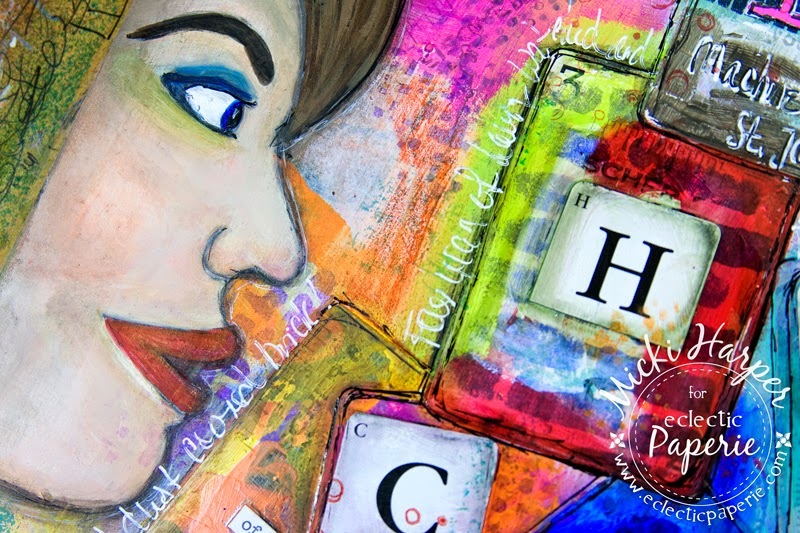 Hi everyone, Micki here to share another one of my art journaling adventures using every single one of those yummy Dina Wakley paints, lots of stencils and some playing cards. I began by opening up my art journal, found a couple of somewhat empty pages and covered both pages with some color. One side was painted yellow and the other blue using Faber-Castell Gelatos and my waterbrush during my lunch hour at work or more appropriately called, my therapy session! My initial idea was to sketch a tower of cards, the way one would built them on a table but I couldn't figure out how to incorporate real playing cards. I thought about cutting the cards up and paper piecing my sketch but instead I glued whole cards sort of crooked to my pages (yes, I also brought glue in my traveling art sack). 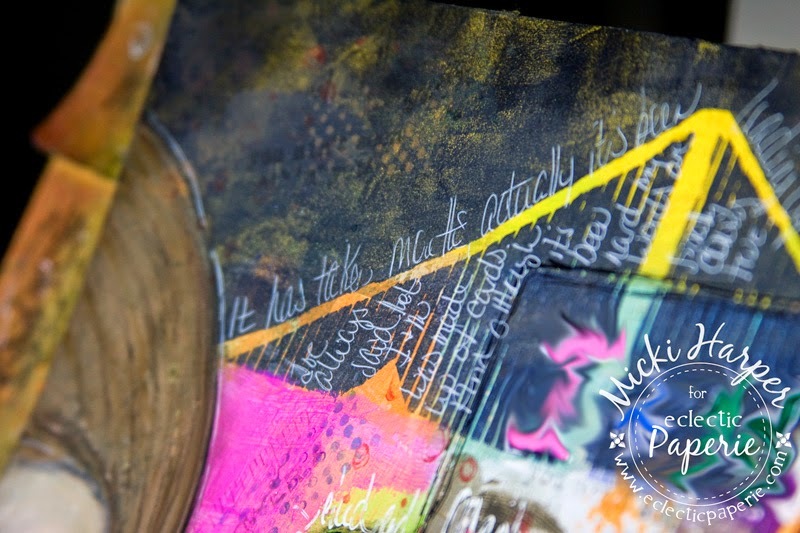 Later that evening, I grabbed several stencils and like I mentioned at the beginning, used every single color of Dina Wakley paints. I threw a lock on my analytical mind and just played with those awesome paints, adding lots of stencil layers. Before adding the stencils over the playing cards, I lightly sanded the cards and covered the cards with a layer of Clear Gesso to ensure that the paint wouldn't chip off. Those playing cards are pretty slick since they were brand new. I thought the lines from the bridge in the Cityscape stencil from The Crafter's Workshop would make great journaling lines as well as a neat background behind my "tumbling houses". I use a blending tool to dab paint through stencils, which seems to work for me. I seem to get the best impressions with no over spill using the foam blending tool. After stenciling the bridge, I continued dabbing my tool around to get the night sky. I liked the variation in the black paint. (Complete listing of stencils and supplies used is below). Then it was time for me to step away. 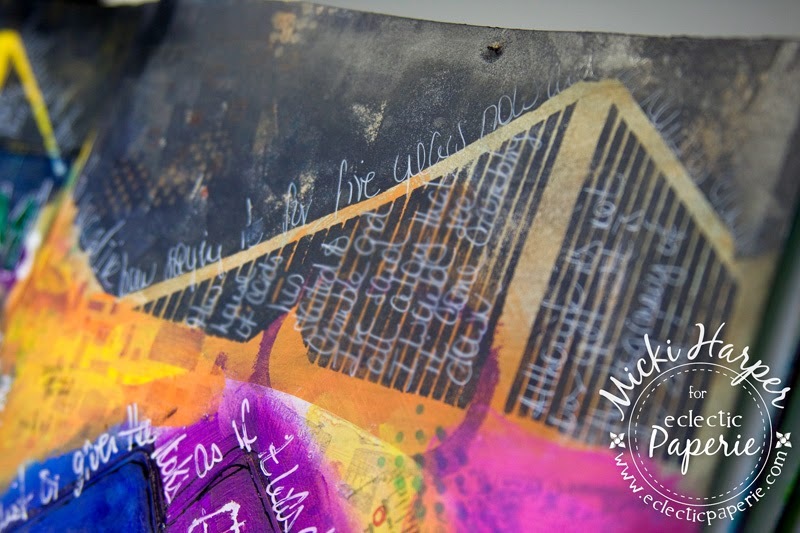 When I came back to the journal the next evening, I decided to tone it down a bit with watered down white gesso. I still wanted the stencil layers to show through but didn't like the background color - not enough contrast. This time as I was adding paint colors I paid a little more attention to my color wheel and placement of color. While the other side was drying, I focused on the face. I initially was going to sketch a side-view face, but ended up using TCW's Profile Stencil designed by Julie Fei-Fan Balzer (who is teaching a class at the eP Shop this fall!!!!). Instead of dabbing paint through the stencil, I lightly traced the face with a pencil so I could make the end result sort of my own and make it look more painterly. Boy, the trouble I had with the lips and eye almost caused me to start over and just stencil the face with paint, but persistence won out. I kept at it. Still not happy with the eye, but trust me, a lot better than the previous layers. To help cover up some of those mistakes, I used some bleeding tissue paper piece under her eye. It covered the black lines even if I could not get the skin color to match the rest of the face. I used a blue watercolor pencil for some eye make-up, which was blended with a wet brush. For shading I used a combination of Stabilo All Pencil and some watered down paint that was left over on my craft sheet. Once that was done, I used my Fude Liquid Ink Roller Pen to doodle around the houses. 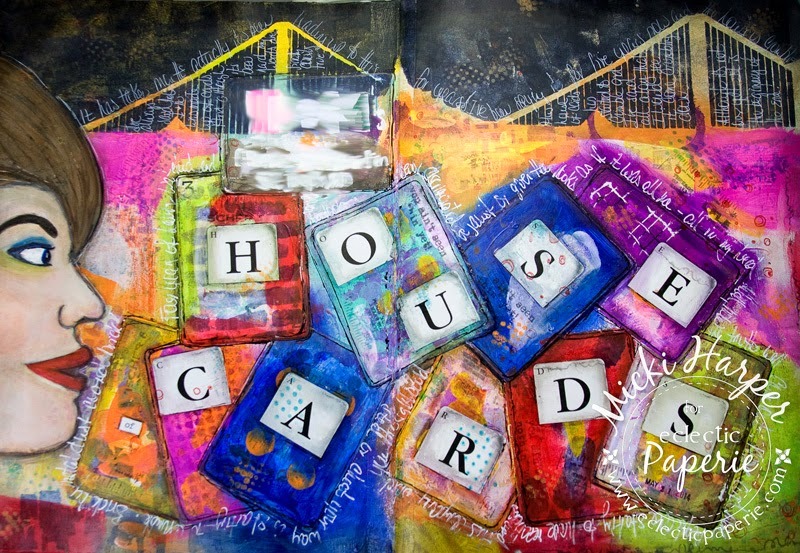 To spell the title of this spread, I used Tim Holtz Idea-ology Alpha Cards which were cut apart and glued to the cards with Beacon 3-in-1 Glue to make sure they stay put. Then I started journaling with with my Uni-Ball White Gel Pen, starting at the bridge but I had quite a bit to say and ended up journaling around each of the houses too. 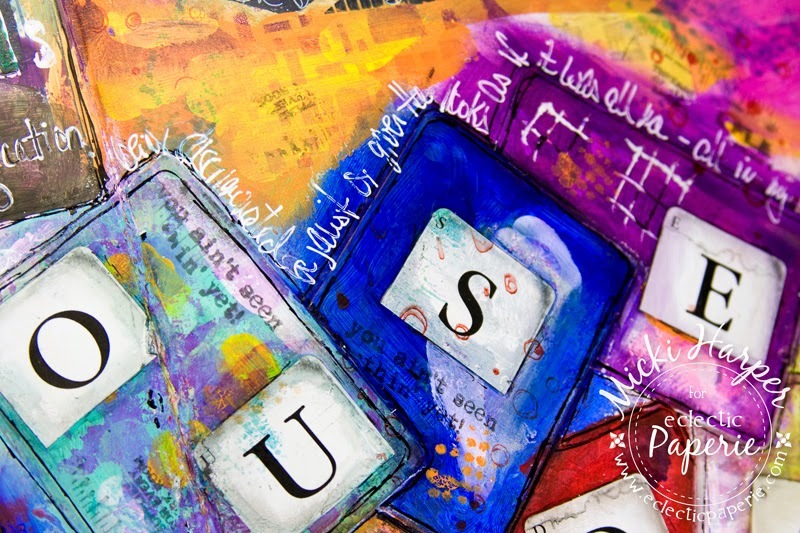 I added some random stamping using some old, but much loved, Wendy Vecchi Studio 490 stamps. Lastly I darkened the edges using Vintage Photo Distress Ink and blending tool. I love how this turned out. Dina Wakley's paints are AWESOME!!!!! And I do like how the side profile face turned out, if you didn't know you might think I painted her from scratch. On a side note, the blurry part in the picture was done on purpose. 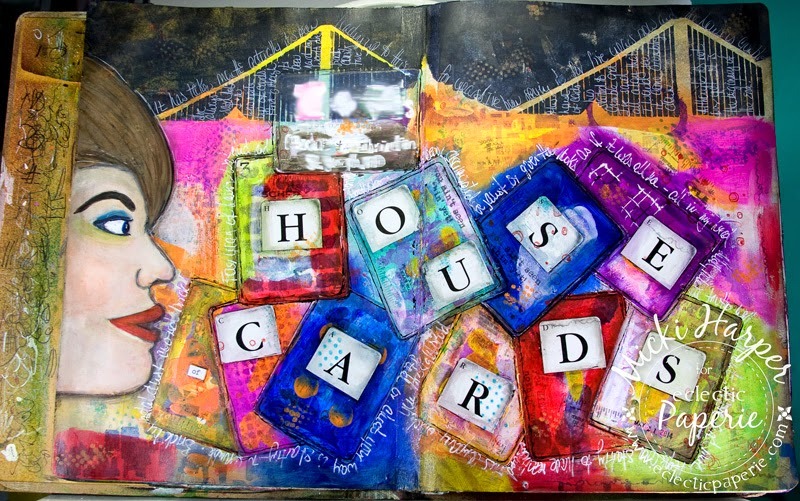 In the journal it's the name of the "house of cards", which is just for me :-). I'm telling ya, the best therapy! I hope you enjoyed this trip through my art therapy session and came away inspired. Oh and if you haven't tried Dina Wakley's AWESOME paints yet, what are you waiting for!!!! 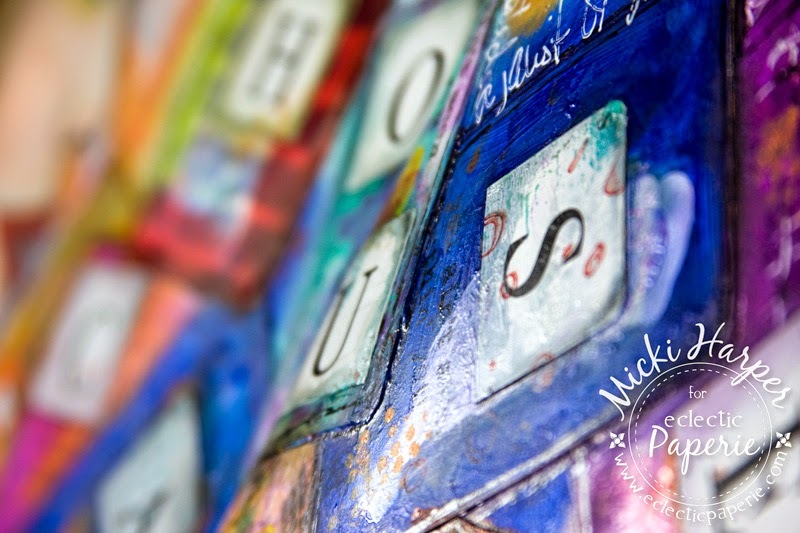 What a wonderfully creative design for your pages Micki! LOVE the bright colors - the awesome coloring on the face and the CARDS!! Oh wow! This is incredible, Micki!!!! I am drawn to bright colors, so this is right up my alley! You know what, Micki? 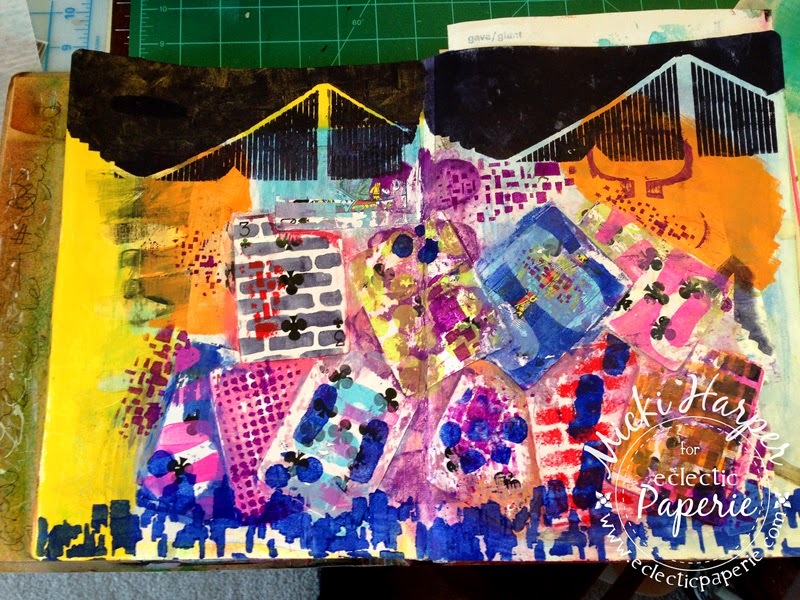 I LOVE LOVE LOVE your journaling in the lines of the bridge and your cards are so vibrant and FAB! LOVE the way the face turned out, too! The tissue and the blue eye shadow were terrific touches! LOVE your pages!